The decor in a restaurant always leaves a lasting impression with me and when I walked into the Thaikhun in Nottingham, it was stunning. I felt like we had been transported to Thailand and it was such a special find and a gem located in the Intu shopping centre. The restaurant is very spacious and every corner is decorated differently and it is so interesting. I love the attention to detail and the staff are very friendly, knowledgable and attentive. Once we sat down we went through the drinks menu and started off with cocktails. 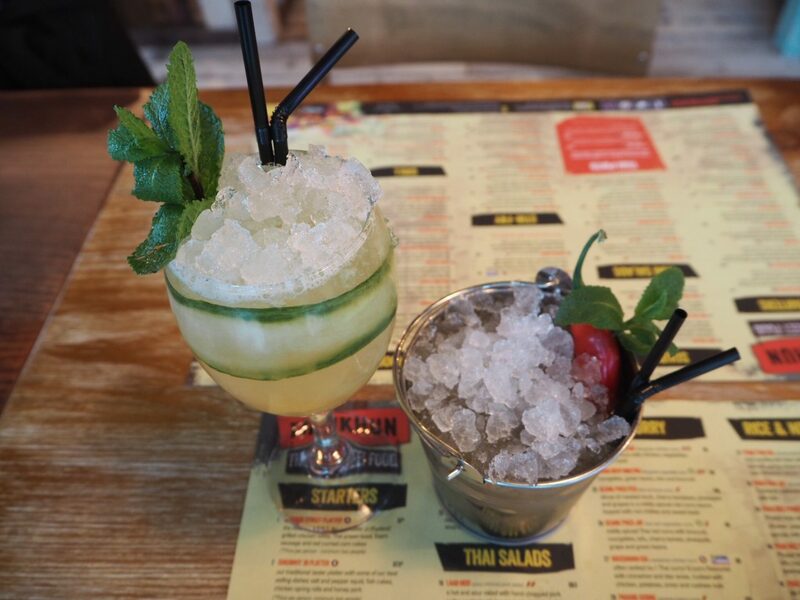 I went for the Gin Cooler and Amit went for the Thaikhun. His was full of authentic Thai flavours such as ginger, lemongrass, chilli and mint shaken with Chivas Regal, velvet falernum and apple juice. The cocktails were delicious and presented really nicely too. At no point did we feel rushed or pushed to order our food and I felt like it was a nice relaxed restaurant. It was a slightly chilly day and I had soup on the mind so I chose the Tom Yum Gai. The portion was massive, and much more generous than other restaurants and it was delicious. The flavours were just right and I could have carried on indulging in this soup as it was so good but we had to of course try the rest of the food! Everything sounded superb and we couldn’t decide so we went for the Bangkok street platter so we could try a little bit of everything. 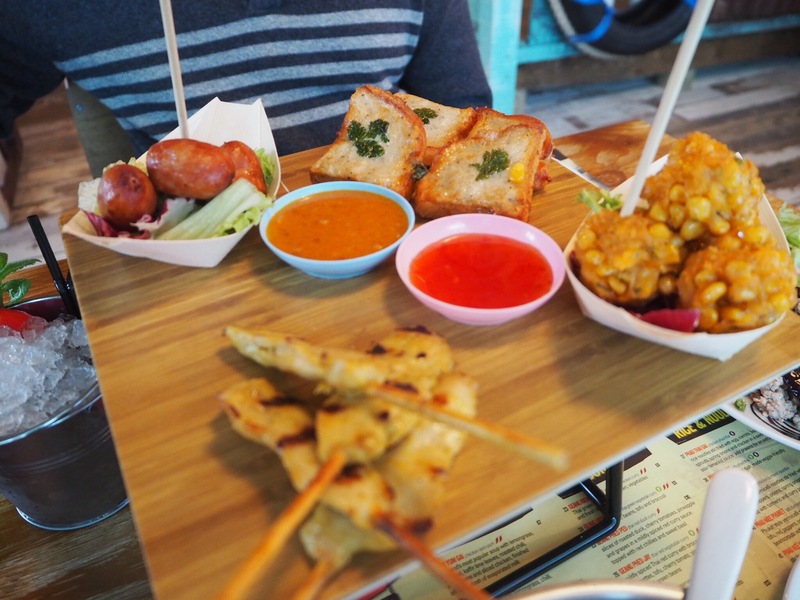 In this platter you get grilled chicken satay, Thai prawn toast, Esarn sausage and red curried corn cakes. The highlight for me was the Thai prawn toast,which was moreish. We also opted for the Laab Moo, which was spicy minced pork hot and sour salad with hand chopped pork collar cooked with lemon roasted rice, shallots, kafir lime leaf, spring onion, ground chilli & mint. This had a kick to it and a gorgeous flavour. For mains (even though we were pretty much stuffed at this point) we went for the Massaman Gai chicken curry, which is often ranked the no.1 Thai curry! A curry flavoured with cinnamon and star anise, cooked with chicken, potatoes, onion and cashew nuts. This was SO good and we had it with rice. This was so flavoursome and really recommend it. Everyone has a secret space in their stomach for dessert and I utilised mine and went for the crunchy banana fritters and vanilla pod ice cream. OMG this was so worth it so you have to order it if you visit Thaikhun. The whole dining experience was wonderful. The food was delicious, the service was fabulous, the ambience was top notch and the location was convenient too. Perfect spot for lunch in the midst of a day of shopping or even just as a lovely venue as it is also surprisingly peaceful and relaxing in the restaurant. 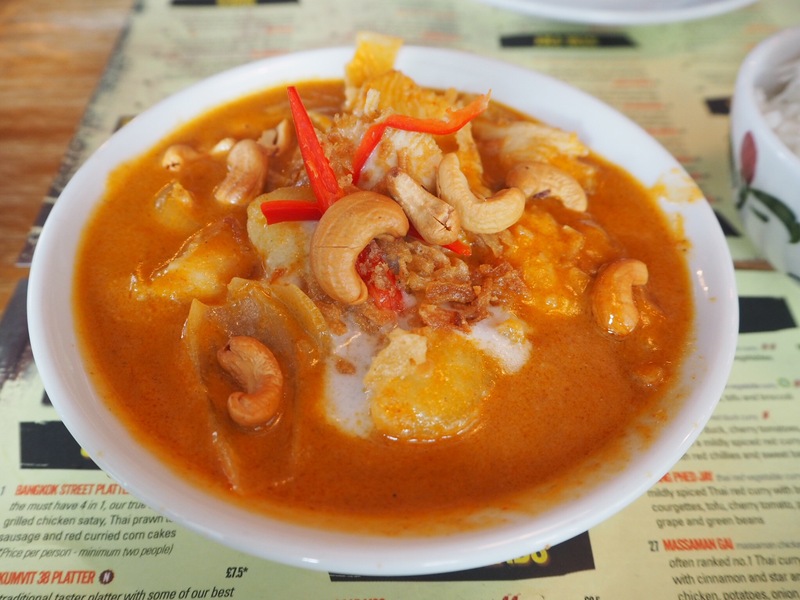 There are Thaikhuns in other cities too such as Cambridge and Manchester, so do check it out. If you are based in Nottingham, and haven’t been yet do give it a try!